Mail4Rosey: Pure Costumes Has Really Outdone Themselves for Halloween This Time! Pure Costumes Has Really Outdone Themselves for Halloween This Time! Today I am grateful... grateful that instead of talking about hurricane damage (because outside of losing internet, we had none!! thank you to so many of you who sent e-mails to inquire, I will be in touch soon!! 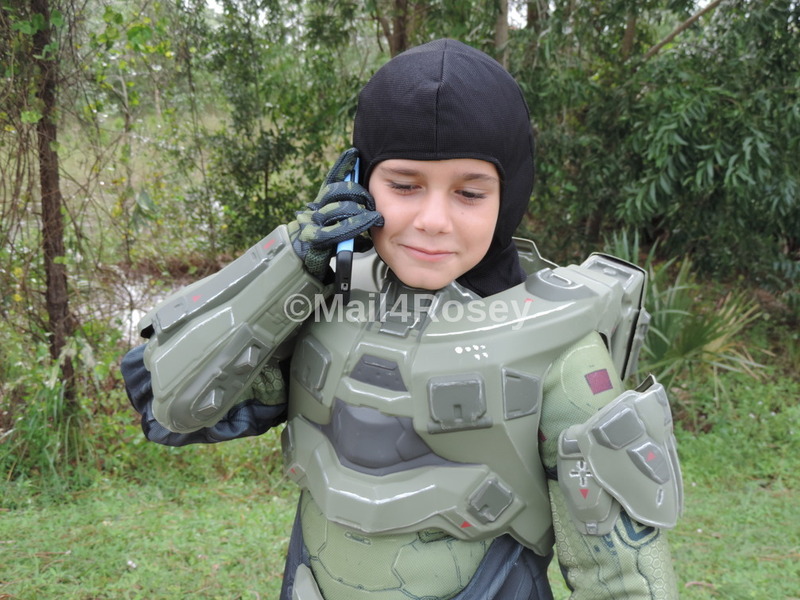 ), I can talk about this Master Chief outfit from Pure Costumes! In a word, this costume is amazing. It makes my son look good and feel great!! I think he really thinks he's a super power in this bad boy (he likes it because it looks military, he's never actually played the video game Halo, which is where the character comes from... I know a lot of people have though, and love it!). Comprised of 32 pieces, this costume is by far the best one my son has ever owned. 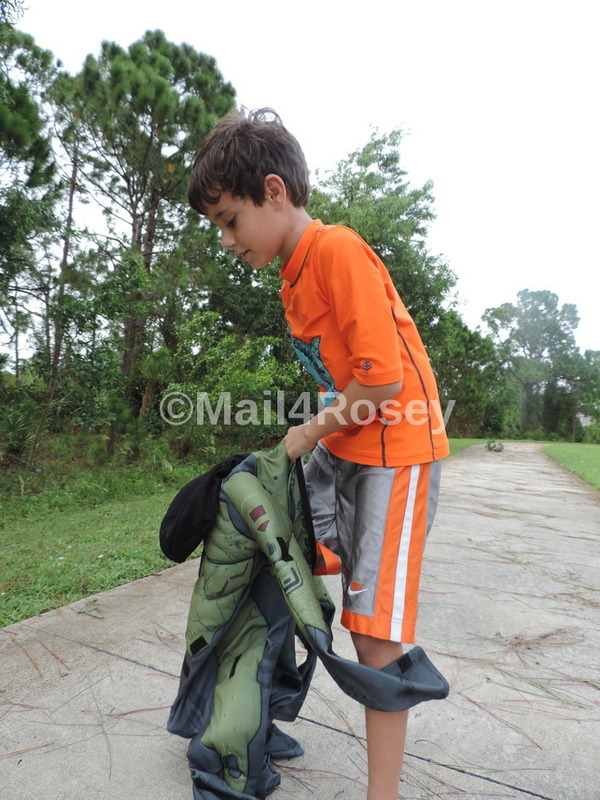 Each piece (except the helmet, which is heavy-duty, is very light-weight (but not cheap) ,which is very important for the kids because it allows them to move/walk easily. The pieces attach to and with Velcro. That makes it handy to remove pieces as needed (such as the seat armor when you're sitting). The body suit (the base piece) is nice and toasty warm, and my favorite part about it is the hood! That makes it perfect for keeping the chills away from kiddos on cold October nights, without them having to wear a coat and hat (they actually won't need gloves either, since the costume comes with them). Nothing spoils a cool costume faster than having to wear a winter coat on top of it! The hemet has a button on the left-hand side. When you hold it, lights on both sides of your helmet come on. This helmet is tough! It looks awesome too. You can't see inside it at all, but Master Chief has no problems at all seeing out in every direction. Every single thing about this costume is great, but its the jet packs that make my son giddy. He absolutely loves this part of the costume. It was this moment though, that made my day (in the photo above). I texted my sons siblings to show them the costume (yep, it was that cool) and his oldest brother called right away. The look on my youngest son's face is priceless... that mixture of pride and happiness that every mom likes to see when their child is feeling especially happy is all over his face in this one. No two ways around it, this is an exceptional costume. For the record, he got his Ninja Costume from Pure Costumes last year too, and it was such a good quality, that he still has that today...and wears it every now and again just for fun. I highly suspect this one is going to last a good long while too. I can't say enough good things about Pure Costumes. We just love them! You can learn more about them by visiting their website. You can also follow them on Facebook, Instagram, Pinterest, and/or Twitter. That costume looks amazing. My son would go nuts over that, I need to look into getting him one. Pure Costumes sounds like such a great place to buy costumes! I'm going to have to check them out. Love that costume, and I bet my nephew would be super excited to wear that on Halloween! Not only is your son handsome, this costume is outstanding. I've not seen one so realistic in a very long time. It's a wicked cool costume. I bet it turned some heads all right. That costume is amazing. I wish we could do things like that but the Florida heat won't allow it. What a neat costume! I'll have to check out the site. How cool! Master Chief is ready to battle some alien invaders! This is one of the best costumes I've ever seen. It looks EXACTLY like Master Chief. What a great costume! My son will love this. I love this and I know that My 5 year old would go crazy for a costume like this. That is one amazing costume! My boys would be excited to wear this. What a great idea for Halloween. I really like it! Pure Costumes is incredible, judging from the Master Chief costume from Halo. I think I have been watching too much Gordon Ramsey, as I read it as Master Chef and thought it was about time he moved on from the aprons! Your son is terrific in the costume. Okay that costume is just too cool. Does it come in adult size? That costume is awesome! I know so many kids obsessed with Halo, and they would flip out for this. That seems like such a quality costume! They did a great job with the design. That costume is amazing!! Great job!! Oh wow! That is so awesome! Every kid would love that for the Halloween costume! Your son rock it! This is really absolutely awesome! That's incredible, the detail is amazing and I can imagine this being a hit with his friends too. A lot of people will be looking at that costume with envy! Seriously, this is the coolest costume ever! He is going to be the envy of the neighborhood kids this Halloween! Wow, that costume is dead on for a Master Chief from Halo. I'm so impressed and can absolutely see why your son would love it. Oh my! My boys will go crazy over this costume! It's really accurate and it's not like most costumes that doesn't look comfy. This one is really wearable! What a tough costume! This would be fun this coming Halloween. Kids are getting ready too for their costumes. What a great costume! What child wouldn't be super happy to wear this costume?!?! Now that is a costume. He'll have loads of fun sporting that around. This costume is amazing. My Son would never want to take it off. I love how realistic it is. This is literally the most well tailored children's costumes I have ever seen. They have done a great job!! That is an amazing costume. He will get so many compliments from parents and kids too. Now that is a cool costume! I can see how the kids would love them! That costume is super cute and authentic! We are shopping around for costumes now and I will definitely be hitting up Pure Costumes! Thanks for the Intel! That's so cool! I want! Mica wants to go as a Star Wars something or rather. He changes his mind daily. It's hard because he's in adult sizes now. Isaak's like, "I'll just be what I was last year." That is one cool costume! My son would love it. That costume is super cool even my son who is in his teens seems to like it ! Whoa... I have never seen a cooler costume! My little cousin would ADORE this and so rock it. Oh wow! This Halo costume looks very believable! My son would love this. That's one of the best costumes I've seen. I am glad that there is no hurricane damage. We were lucky here that we didn't get flooded. Anyway, that costume is awesome! That is one amazing costume! I think my hubby might want to borrow it when your son is done! What a great costume! He looks like he was having a blast wearing it too. I will have to check this our for my kids Halloween costumes this year! That costume is legit! I know it's for Halloween, but I'm sure he'll get so much use out of it. Love how easy it is for kids to wear & pretend in. This is so freaking awesome!!! I want one for myself, haha! Both my nephews are all grown up and I think they will still envy kids who are able to wear this costume! It's really awesome and I can imagine it being a huge hit with the kids. I am not a fan of Halloween or wearing costumes. However, I will have to admit that that is one wicked costume, and I mean that in the best way! I'd like to wear something like it in my size in a future party. That's an amazing costume! They came up with a really cool costume. We are struggling to figure out what to do for Broxton. That is one legit costume! I know my husband would probably geek out over this more than the kids! Oh WOW! What a costume! Wow, I love how they come with that concept, I like how it looks. I would eventually look for a Halloween costume as well. Thank you for sharing! I didn't know they make costumes like this! How cool! My son would've loved that only he's grown up now. Wow. And I say wow because this is so much more of a costume then the Halo one we bought for my son last year! WAy too COOL! Waaah, now I wanna be a kid and wear something like this on halloween! OMG!!! This is too good. Its so much more than a simple cloth made or DIY costume. This is almost right out of a film set. Too cute! I think my daughters ex-boyfriend dressed up as this a few years back. Here we have to look for costumes that we can fit a snowsuit underneath it! That truly is one of the best costumes I have seen. He looks like he came from the movies. That is seriously the cutest costume I've seen all year. I love how they designed it! WOW! Check out that costume! Coolest kid around! I'm sure he'd love to wear that all the time! I love this! I wish my grandson is old enough to wear a costume like that! I'm checking out Pure Costumes for my granddaughter. She will be trick or treating with her cousins this year. My sister and her husband will be taking supervising and walking along with the kids. My boys would LOVE this costume! It really does look terrific. I hate spending money on the 'cheap' costumes that still cost a lot in my opinion! WOW! What a cool costume! My nephew would love this costume for Halloween. That looks like one super cool costume! Wow, I know someone who would LOVE this! Such a wonderful costume that will go well with boys in particular. Such a great idea for Halloween and I am sure your son is so excited about it! Wow! This looks really really cool - & also very functional! I wonder if they shop to Asia! OMG! This is amazing. My son would love to be in such costumes. Let me check if we get this in Singapore. I tried to order the adult version for my husband but it isn't in stock. I will keep checking. Pure Costumes really have outdone themselves - what an amazing costume. I love the practical side as well, that it is warm and easy to move around in with great visibility. Holy moly is that costume so realistic. What a great costume and the craftmanship is impressive. amazing costume if you ask me. This is an awesome costume. I love the craftsmanship. Very well made. this is so cool! I am sure he will be the envy of all his friends! Wow this is quite an outfit and would do for other occasions not just halloween too. I love that the parts attached by velcro that is so much better for children. That's a really awesome costume! I'm sure all the boys would love to have that one. HOLY MOLY! My 9 year old son would DIE for this costume!! That costume is the bomb!! I'm sure all the boys are going to be jealous. Glad to hear you didn't get any damage from mean old nasty Hurricane Matthew. You were lucky! That's an amazing costume. He looks so adorable. Toddlers would surely love to have that too. Wow, that costume is pretty impressive! Gosh that's a cool costume. I bet your son loves it! That is seriously one great looking costume! My son would love to be one of the Halo characters. WOW, with a double thumbs up! I can see how your son is soooooo happy with the costume! It's like a dream come true! Got me interested to see what other costumes they have! NICE! My nephew is going to FLIP when he sees this! The ones we wanted never did come in stock but Rosie we ordered so much stuff and we absolutely love everything! That's a cool way to have Master Chief with you! I would always feel good whenever I see kids happy with what they're given or have. This is really cool costume! I think my boys would love something like this for Halloween! That is certainly a realistic costume! I appreciate when companies offer a little something more. Wow I super love this costume! I can see my son wearing this in the future. Thanks for sharing! This is the coolest costume I'd seen so far... NIce leh! Wow, what a lovely costume! He seems like enjoying his Halloween this year.